The scent of the flowers from a special frangipani tree wafts its way through this delightful story, in which one particular annual fancy dress carnival goes down in the annals of the author’s family history. Set in Northern Queensland, Australia, in the 1950s, The Old Frangipani Tree at Flying Fish Point exuberantly and sensitively tells the story of how family and neighbours rally round to help Faith, author Trina Saffioti’s mother, to become an island princess: an old sheet becomes her sarong, and she borrows a ukulele (what does it matter that it hasn’t got any strings?) – but the crowning glory, both literally and figuratively, are the lei and headdress made from threaded white flowers from the gnarled old frangipani tree. And then the frangipani flowers work their magic on the judges and she wins! The Old Frangipani Tree at Flying Fish Point is a great readaloud: it buzzes with zingy dialogue and I especially love the strong sense of oral history being handed down by the way the author refers to family members in relation to herself – so, for example, Faith is Mum. What’s really great is that it wouldn’t actually have mattered if Faith hadn’t won – it’s just fantastic that she did! This review first appeared here on the PaperTigers.org blog as a Books-at-Bedtime post in June 2009. 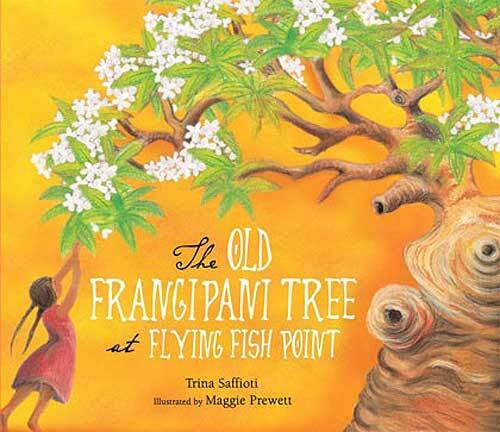 'Branching Across the World: Trees in Multicultural Children's Literature, children's books about trees, children's books from and/or set in Australia, Magabala Books, Maggie Prewett, MWD book reviews, The Old Frangipani Tree at Flying Fish Point, Trina Saffioti. Bookmark.